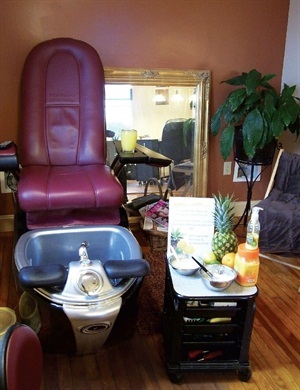 This flavorful pedicure invigorates clients with a homemade yogurt-pineapple sugar scrub and mask, and real citrus fruit slices in the pedicure basin. The salon: Artistic Trends Salon, Sellersville, Pa. This flavorful pedicure invigorates clients with a homemade yogurt-pineapple sugar scrub and mask, and real citrus fruit slices in the pedicure basin. It’s served with a pineapple citrus spritzer, a mix of pineapple and orange juices plus seltzer, presented in a frosted glass. Soak the client’s feet in a tangerine (or other citrus-scented) foot soak. Add one slice each of lemon, lime, and orange to the soak. Offer the client a pineapple citrus spritzer. While the client’s feet are soaking, prepare the sugar scrub and mask. For the scrub: In a meatl bowl, mix about 1 teaspoon crushed pineapple with ¼ cup of sugar. Let the scrub warm in a crockpot for 5 minutes. For the mask: mix about 2 teaspoons crushed pineapple with ¼ cup vanilla yogurt. After applying the scrub, place the mask in the crockpot to warm through. Remove the client’s feet from the tub and dry them off. Massage the scrub into the feet, and let it stay on for five minutes to let the alpha-hydroxy acids (AHA) in the pineapple work in the skin. Rinse feet; dry. Apply a callus softener and wrap feet in towels, leaving toes exposed. Rinse feet; dry. Massage feet with an AHA foot lotion like OPI Smooth.